LATE LAST WEEK, by a razor-thin margin, Greek lawmakers voted to approve a deal normalizing relations with Macedonia, their country's northern neighbor. Chalk up a rare victory for common sense in the Balkans. For nearly three decades, Greece kept up a bitter feud with the tiny country next door, which declared its independence after the breakup of Yugoslavia in 1991. Greeks were infuriated that the former Yugoslav republic, which had always been known as Macedonia, named itself "Macedonia." As far as most Greeks were concerned, that name rightfully belonged only to the ancient kingdom of Philip II and his world-conquering son Alexander, and to the modern Greek province that is also called Macedonia. The government in Athens, backed by a million protesters in the streets, insisted that Macedonia would have to come up with a different name. To put this in American terms, it is as if Mexico were to insist that the US state of New Mexico had no right to use "Mexico" in its name. Or, in a different European context, it is as if the Republic of Ireland were to go ballistic because the six counties of Northern Ireland had the temerity to use the I-word as part of their name. Crazy? No question. Yet for 28 years Greece clung doggedly to this craziness. Most of the world's nations (including the United States) recognized Macedonia by its constitutional name, but Greece raised such a stink that when Macedonia was admitted to the United Nations, it was forced to style itself "The Former Yugoslav Republic of Macedonia." To add insult to injury, Macedonia's ambassador was seated not among the other countries beginning with M, but among the T's — T for "The FYROM." Worse still, Greece blackballed Macedonia — a parliamentary democracy seeking closer integration with the West — from membership in NATO and the European Union. 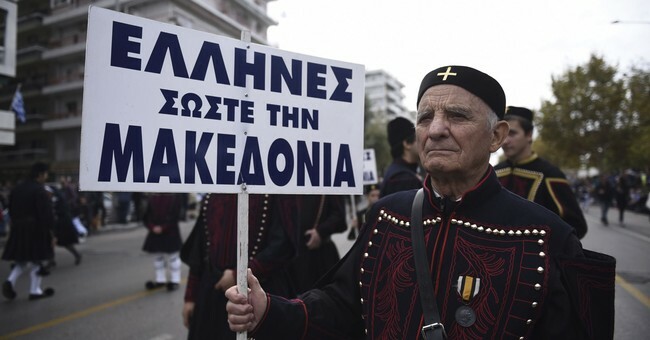 Politicians in Athens insisted, against all evidence, that Macedonia (which they insisted on calling "FYROM") harbored irredentist designs on Greek territory. At one point in the mid-1990s, Greece imposed a 20-month trade embargo on Macedonia, finally lifting it only when the tiny country agreed to change its flag, which had featured the 16-pointed Star of Vergina, a traditional Macedonian emblem. Now, at long last, the conflict has ended. Macedonia agreed earlier this month to formally change its name to "North Macedonia" and Greece will support its accession to NATO and the EU. The two countries' prime ministers, Alexis Tsipras of Greece and Macedonia's Zoran Zaev, have demonstrated what is possible when leadership is in the hands of responsible adults instead of rabble-rousing populists. To outsiders, it may seem absurd that Greece persisted for so long in such a trivial and antiquated feud. Countries all over the world manage to share names without imputing malign intentions to each other. Dominica and the Dominican Republic coexist peacefully in the Caribbean. Guinea, Equatorial Guinea, and Guinea-Bissau do likewise in Africa. Ditto Samoa and American Samoa in the South Pacific. Then again, who is to say which grudges are too trivial or antiquated to take seriously? Resentments run deep in the Balkans, where ghastly conflicts erupted at both the beginning and the end of the 20th century, but they also run deep in the Middle East, and in Kashmir, and in Afghanistan. Resentments ran deep in France during the wars of religion, in Spain during the struggle over the Spanish throne, and in Rwanda, where they escalated into genocide. Human beings have a terrible talent for fanning the flames of umbrage into destruction and death. For two countries to be at daggers drawn over which has a better claim to the name "Macedonia" is ridiculous. But is it any more ridiculous than Mexico and France goading each other into war in 1838 over the fate of a looted pastry shop? Or than the War of Jenkins's Ear, which was triggered by reports that a British sailor's ear had been severed by hostile Spaniards? History is replete with examples of politicians and demagogues whipping up seemingly minor disagreements into vendettas for which mobs demand blood. Happily, the long skirmish over the name "Macedonia" never reached that extreme. It was a pigheaded quarrel that could have led to violence; instead it is ending in compromise and relief. Every now and then, statesmen and diplomats do the right thing, and the world becomes a little better.